Over time, your vision and overall health changes. 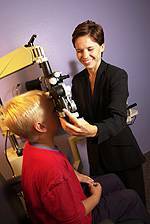 That, more than anything, is why there’s a general procedure to follow during an eye exam, and why it’s important to visit your eye doctor in Blaine, MN. Without eye doctor visits, these critical changes in vision and eye health may go unnoticed. Visiting your Blaine eye doctor regularly is the only reliable way to maintain healthy sight and possibly prevent mild to serious eye diseases.